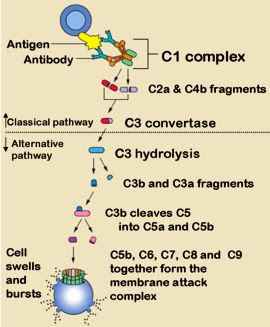 Classical pathway: Here complement system is activated by antibodies bound to pathogen surface or antibody-antigen complexes, thus involved in specific and acquired immunity. Step 1: Activation of C1 by binding of Antigen antibody complex. Step 2: activated C1 is a protease which cleaves C2 and C4 to form C4b2b complex. Step 3: C4b2b complex is a C3 convertase that cleaves C3 molecule into two fragments C3a and C3b. C3a ia an anaphylatoxin(not involved in the down pathways). Step 4: C3b forms complex with C4b2b producing C5 convertase (C4b2b3b). Step 5: C5 convertasecleaves C5 to C5a and C5b. C5a is an anaphylatoxin and chemotactic factor (not involved in the down pathways). Step 6: C5b binds to C6 and C7 to form a complex initially then interacts with C8 and C9 to produce the “membrane attack complex (MAC)” (C5b6789). This membrane attack complex causes cell lysis. Normally ‘b’ fragments continue in the main pathway and ‘a’ fragments split off and has specific activities. Anaphylotoxins: induces the release of inflammatory mediators like histamines from the mast cells. C3a, C4a and C5a are the anaphylatoxins of which C5a is the most potent. Chemotaxis: C5a attract neutrophils and also enhances adhesiveness of neutrophils to the endothelium.